In a short interview with The Seoul Times the Australian envoy argued for broadening the range of bilateral businesses between South Korea and Australia. “By agreeing on the upcoming FTA, we hope that both nations will expand bilateral trades to such areas as culture, service, banks, insurance, and exchanges of university students,” Amb. Gerovich said. The fourth round of FTA between South Korea and Australia is scheduled on March 15-19, 2010 in Seoul. 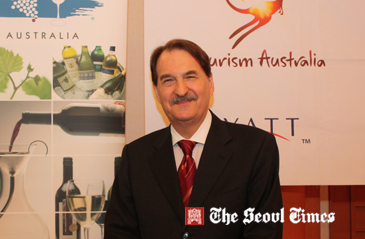 The interview was conducted during Australian Chamber of Commerce in Korea (AustChamKorea)’s annual general meeting held at the Westin Chosun hotel in Seoul on Jan. 29 (Friday), 2010. 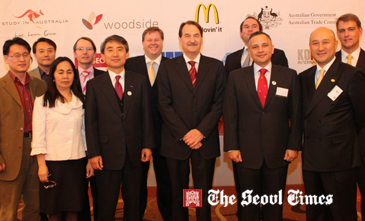 Australian Envoy Sam Gerovich (5th from right) poses with members of Australian Chamber of Commerce in Korea at its annual gathering held at Westin Chosun on Jan. 29, 2010. The 60-plus members of the chamber also celebrated Australia Day at its dinner gathering. The dinner reception was an occasion where Australian businesspeople here in Korea reviewed their business performances and exchanged business information each other. The members of the chamber also celebrated its first anniversary as an independent chamber in Korea. The Australian chamber was formed a year ago when it was broken away from ANZCCK (Australian and New Zealand Chamber of Commerce in Korea). The attendees included Australian Ambassador to Seoul Sam Gerovich, who also serves as AustCham’s patron, AustCham’s Chairman Sean Rodrigues, and AustCham’s Vice Chairman Mark Redmond. Chairman Les Edwards of the New Zealand Chamber of Commerce in Korea also took part in the gathering. The gathering started with the presentation of a financial report by AustCham’s treasurer. Amb. Gerovich made a congratulatory address in which he praised achievements and performances of members of AustCham the past year. The Australian envoy congratulated the board of AustCham for organizing and finalizing the AustCham as an independent chamber. He urged all members of AustCham and financial sponsors to continue strong support in 2010 as well. Ms. Pilar Perez-McKay, executive director of AustCham in Korea, touched upon the importance of Australian businesspeople having independence voice from New Zealand businesses operating in South Korea. “We hope that it will bring bigger success for both parties,” she added. She said that AustCham has been dedicating itself to building strong friendship and close economic ties between Australia and South Korea. She added that AustCham is now striving to develop stronger ties with Koreans. Its annual gathering provided a great opportunity for all attendees to reflect on what they have achieved and what they can do to contribute themselves to make Australia a better country for the future, according to Ms. Perez-McKay. For those who are interested in upcoming events or building networking with the members of Australian Chamber of Commerce in Korea, please contact the below for more information. Ms. Sun-Young Kim serves as staff writer for The Seoul Times. She majored in English Literature at Catholic University. She covers culture and Seoul's foreign communities. Her hobbies include watching movies, drawing, and traveling.